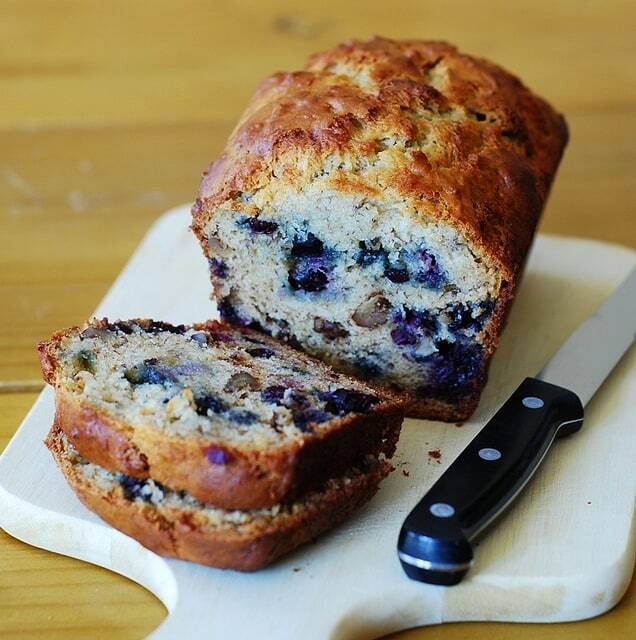 Blueberry Banana Bread – moist, delicious, easy-to-make, with a beautiful texture and flavor from blueberries. 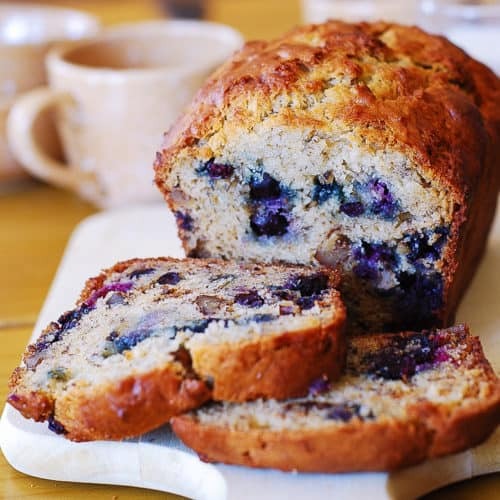 It’s a basic banana bread recipe made a little bit more special with the addition of blueberries. Only 1/3 cup of butter is used, the rest of it replaced with Greek yogurt and bananas. You’ll love this easy recipe for its utter simplicity. This recipe makes 1 banana loaf. Two very ripe bananas and one package of blueberries were sitting on my counter, so naturally I had to make a banana bread with blueberries. I wanted something different from the banana bread recipe I used a couple of weeks ago, so in addition to blueberries, I also added Greek yogurt. Well, adding the Greek yogurt was sort of a necessity (as opposed to creativity), since I only had 2 bananas while the recipe called for 3, so I measured that 1 mashed banana equaled 1/3 cup in volume, and that’s how much Greek yogurt I added to replace the missing banana. 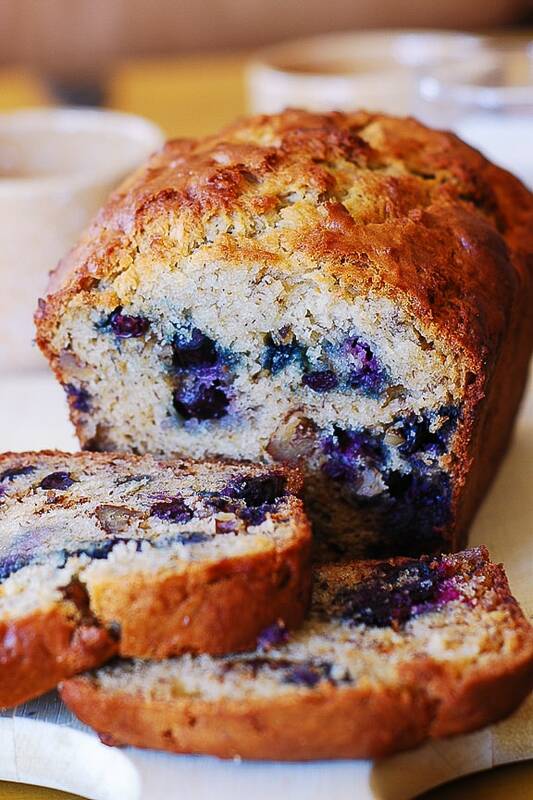 Blueberries add so much to banana bread! 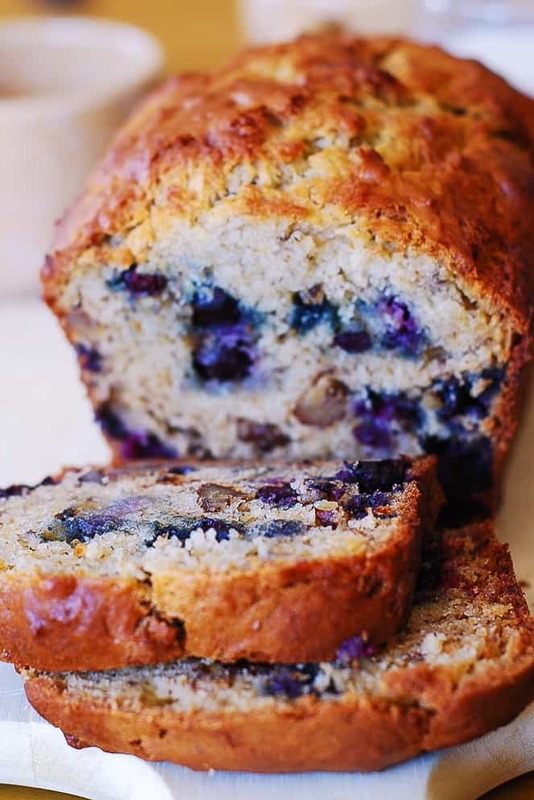 In addition to the berry flavor, blueberries make the banana bread even more moist, without letting it lose the texture. Biting a slice of banana bread with blueberries is very much like having a slice of a berry cake: juicy and fruity, but without all the butter. I still can’t believe that this moist loaf of blueberry banana bread has only 1/3 cup butter, the rest of butter replaced by Greek yogurt and bananas. I need to make recipes like this more often! In fact, other berries work really well in banana bread recipes, such as in this strawberry blueberry banana bread. Use very ripe bananas. Wait until the bananas turn black on the outside and get really soft to the touch. When peeled, such bananas are still white inside but very soft and mushy, not really holding their banana shape. Mashing such bananas with a fork is very much like stirring the smoothie: effortless! That’s when the bananas are at their sweetest! Do not overmix the batter. Use only the wooden fork or a wooden spoon to mix the banana bread batter. Why? Overmixing allows gluten to develop in the banana bread batter which will result in a dense loaf. If you don’t over mix you will have a nice tender and soft loaf. It’s OK to even have minor clumps in the batter here and there. Line the bottom of the pan with parchment paper. Butter the parchment paper and then pour the banana bread batter. This ensures that the bottom of the bread will not get stuck to the baking pan. A slather of butter. Just add it on top of your warm slice of bread. 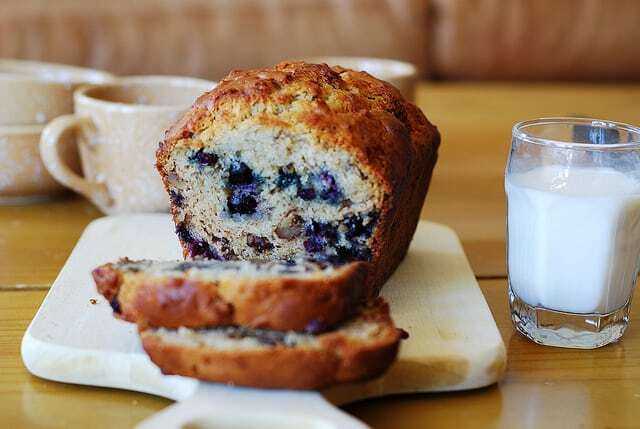 All of the below recipes are similar to this blueberry banana bread in the respect that they are more than just basic banana bread recipes, yet the additions are so simple that none of these recipes are time consuming. All of them are as easy and simple as if you were making a basic banana bread. Strawberry blueberry banana bread – combine two types of berries for a delicious, moist, and colorful dessert bread. Banana bread with walnuts – nuts are always a great addition to banana bread. Pumpkin banana bread with apples – a great recipe to save for the holiday season. Banana bread muffins – just like the banana bread, but made in a muffin pan. Nice individual portions, perfect for picnics or snack to pack for school/work. 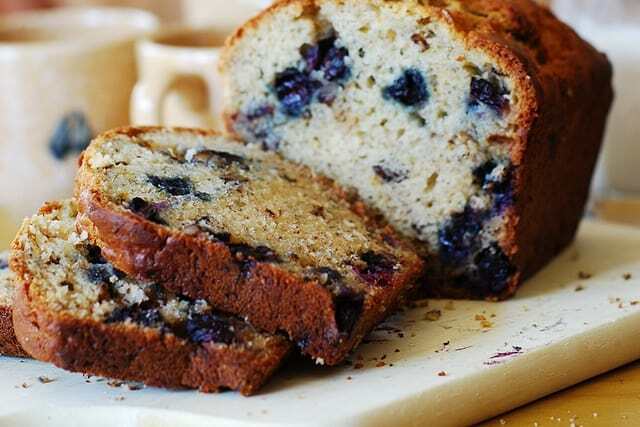 Blueberry Banana Bread - delicious, easy breakfast bread made with Greek yogurt and blueberries. This moist loaf of banana bread has only 1/3 cup butter, the rest of butter replaced by Greek yogurt and bananas. Tips for how to make light and fluffy loaf and avoid dense and rubbery texture. Preheat the oven to 350 F. This recipe makes 1 banana bread loaf. In a large bowl, mix mashed bananas, Greek yogurt and melted butter, using wooden fork or spoon. Mix in the sugar, egg, and vanilla. Sprinkle the baking soda and salt over the mixture and mix in. Add the flour last, mix just enough to blend the ingredients; do not over-mix, the lumps will work themselves out. Add whole blueberries to the batter and mix them in to distribute evenly through the batter. Butter a 4x8 inch loaf pan. Line the bottom of the pan with parchment paper, butter the parchment paper too. Pour the batter in the pan. Bake for 1 hour. Cool on a rack. Remove the banana bread from pan and slice to serve. Most and delicious! I used half the amount of sugar because I don’t like it too sweet, and it was perfect. Next time I might add a pinch of cinnamon. So glad you enjoyed it! 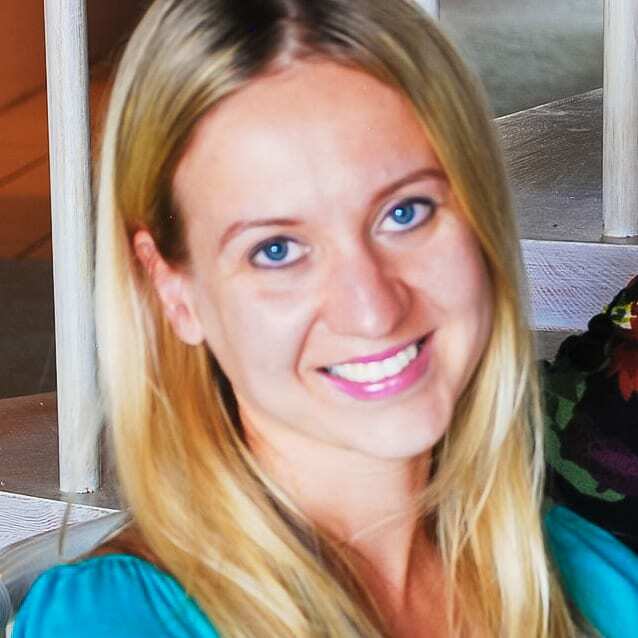 I am the same way – I don’t like my desserts too sweet and often reduce the sugar amounts. This was moist and delicious! I used about half the sugar because I don’t like it too sweet, and it came out great. I think when I make it again I might add a pinch of cinnamon. Thank you, I am glad you enjoyed it! I don’t like my desserts too sweet either. Adding a pinch of cinnamon is a great idea!